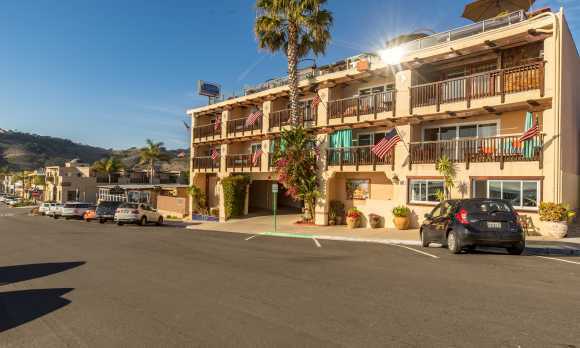 If you are looking for the definitive California beach front hotel, this is it. The Inn at Avila Beach is a unique Beach House-style Inn which mixes the best elements of Mexico and the Mediterranean, all within steps of sand, surf, sun, fun, fine dining, and golf, in a true California beach town. Our roof-top deck offers 180 degree views of the ocean and the beautiful California Central Coast. There is nothing like it in this area. Our other amenities and services include: Concierge services for guests, including transportation arrangements and dining reservations, Complimentary high-speed wireless Internet access, Cable TV, with access to our library of DVDs and VHS tapes, Private bath with hairdryer, In room coffee makers, Iron and Ironing board and Complementary coffee, tea, hot chocolate and popcorn in the lobby. Even though we are a relatively small inn with 32 rooms, each room is different and designed for a different experience. Sometimes you bring the kids, sometimes you purposely don't. Each guest is unique, so please ask questions to find your special place. Ultimately the Inn at Avila Beach is about celebrating the joy of living, with its' vivid colors, warm feelings, friendly staff, and rhythmic sounds of wave after wave. Nowhere on the coast can you sleep so close to the ocean, except perhaps on a boat.